This podcast is brought to you by the Association of Academic Physiatrists and its Medical Student Council. The AAP's Medical Student Council (MSC) brings you Pocket Mentor, a forum for medical students to get to know leading and up-and-coming PM&R physicians. 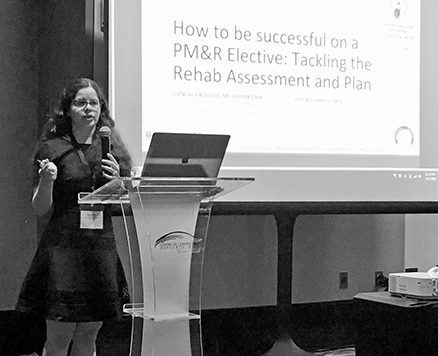 In this episode, Barbara Kozminski, MD brings to you a session at Physiatry '19, the AAP's Annual Meeting, called "How to Be Successful on a PM&R Elective: Tackling the Rehab Assessment & Plan". The session presenters you will hear are Dr. Glendaliz Bosques, Associate Professor at UT Health/ TIRR Memorial Hermann/ McGovern Medical School, and Justin Schappell, MD, an incoming Resident at Mayo Clinic. You will also hear from medical student participants of Physiatry '19, who share their insights on the conference, sessions, and PM&R interest. You can learn more about the Medical Student Council at www.physiatry.org/medicalstudents. The council is also on Twitter @AAPhysiatry_MSC and on Facebook @AAPhysiatryMSC. This episode features music by Bryan Le.